Most of the conversation was about the Apache Kafka pipeline and the use of Apache Samza for processing it. Communication between the clients and the servers is done with a simple, high-performance, language agnosticTCP protocol. We provide a java client for Kafka, but clients are available in many languages. 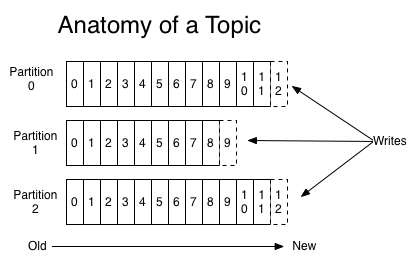 Let’s first dive into the high-level abstraction Kafka provides—the topic. Each partition is an ordered, immutable sequence of messages that is continually appended to—a commit log. The messages in the partitions are each assigned a sequential id number called the offset that uniquely identifies each message within the partition. The Kafka cluster retains all published messages—whether or not they have been consumed—for a configurable period of time. For example if the log retention is set to two days, then for the two days after a message is published it is available for consumption, after which it will be discarded to free up space. Kafka’s performance is effectively constant with respect to data size so retaining lots of data is not a problem. In fact the only metadata retained on a per-consumer basis is the position of the consumer in in the log, called the “offset”. This offset is controlled by the consumer: normally a consumer will advance its offset linearly as it reads messages, but in fact the position is controlled by the consumer and it can consume messages in any order it likes. For example a consumer can reset to an older offset to reprocess. 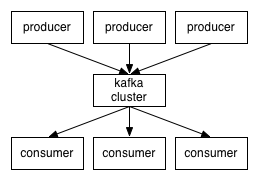 This combination of features means that Kafka consumers are very cheap—they can come and go without much impact on the cluster or on other consumers. For example, you can use our command line tools to “tail” the contents of any topic without changing what is consumed by any existing consumers. Simple API: Unlike most low-level messaging system APIs, Samza provides a very simple call-back based “process message” API that should be familiar to anyone that’s used Map/Reduce. Managed state: Samza manages snapshotting and restoration of a stream processor’s state. Samza will restore a stream processor’s state to a snapshot consistent with the processor’s last read messages when the processor is restarted. Processor isolation: Samza works with Apache YARN, which supports processor security through Hadoop’s security model, and resource isolation through Linux CGroups.